I nearly bought a Union Jack gazebo. Apart from silly Union Jack trousers, I would happily have more jubilee memorabilia in my house if I had the space. But, sadly, as we already own a gazebo, it was unnecessary. It got me thinking about what is stereotypically British. The Queen. Fish and chips. Real ale. Talking about the weather. Queuing. 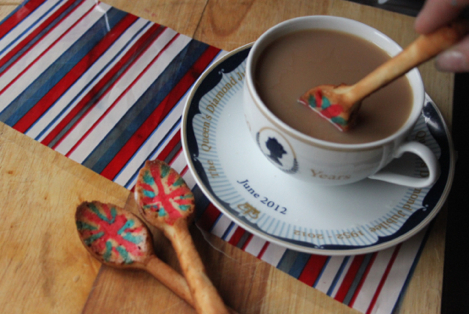 And you can&apos;t stir your tea (which so happens to be in a commemorative cup and saucer) without a spoon. 1, Stir the butter into the icing sugar and beat until smooth. Mix in the plain flour, egg white and vanilla extract until you are left with a smooth batter. 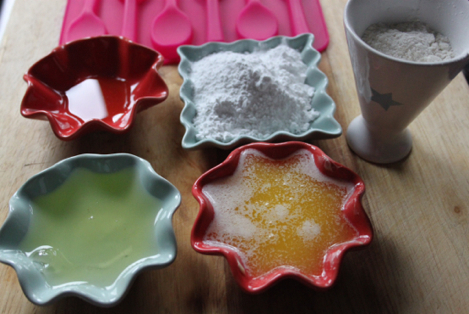 2, Take two small bowls and in each place 1 and a 1/2 tsp of the batter. Colour one red and one blue. I used three or four drops of red food colouring liquid and used a tiny blob of blue food colouring paste. You want them quite bright but the colour will intensify once cooked. 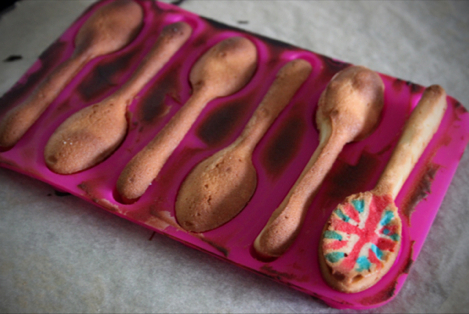 4, Take your spoon mould and pipe a union jack into the bowl part of the spoon moulds. I found it easiest to pipe all the red in a cross then add the diagonal stripes, then pipe the blue in between each gap, then fill in any gaps with the uncoloured batter. Use a cocktail stick to clean up any mistakes. 5, When you&apos;ve finished piping, mix the milk with the remaining batter to make it looser. 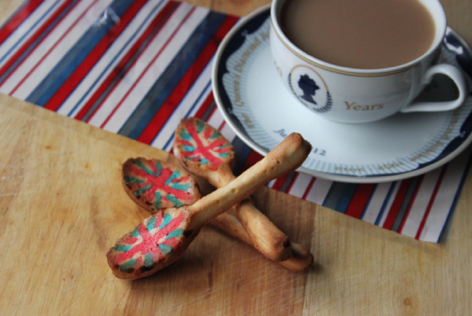 Spread gently over the union jack part and then fill the remaining spoon handle cavity. 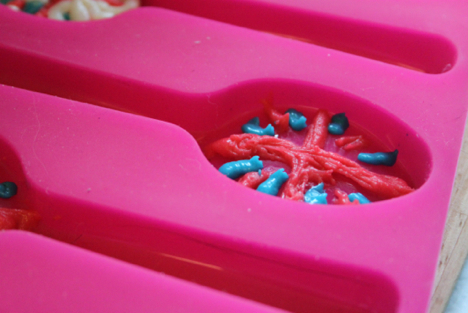 Slide the mould onto a baking tray and bake for 5-6 minutes or until just golden brown. 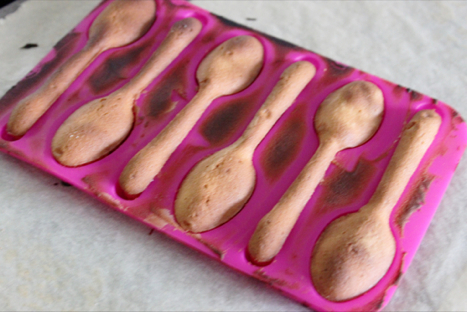 6, Leave the spoons in their moulds for a couple of minutes before removing and Serving. Store in an airtight container. 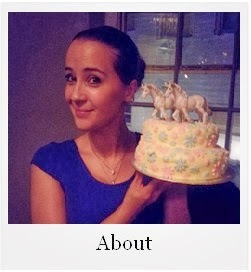 I am entering my spoons in the Jubilee Baking Competition hosted by the very lovely Fleur of Homemade by Fleur. The competition is sponsored by Appliances Online and I am seriously looking forward to seeing the round up of all the great bakes and cakes! Many, many, many thanks for everyone&apos;s lovely wishes and words for the wedding. It all went off without a hitch and will tell you all about it - and the honeymoon - when the professional shots come back from our lovely photographer. Thank you again! Thanks Fleur, I picked up the spoon mould last time I was in Calais as I couldnt find one for sale in the UK that was ok to put in the oven - will keep hunting for you! Thank you Laura - They were a bit of a pain to pipe out but definitely worth it for the wow factor! Thank you :) I agree on discovering new blogs! Thank you, they went down very quickly with plenty of cups of tea! Brilliant idea- I agree, the absolutely perfect edible biscuit! Thank you Kate, I can't decide whether they should be called ciscuits or bisakes...!